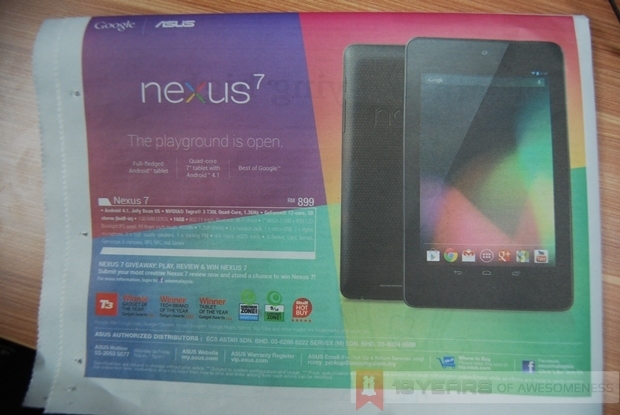 We spotted this advertisement on a local newspaper earlier today, and it appears that ASUS Malaysia have finally brought down the price of the Nexus 7 tablet. Many criticized ASUS for retailing the local version (16GB WiFi only) at a princely sum of RM999, when in the US it was going for only $249 (roughly RM770). In fact, our forums were packed with individuals offering bulk orders of the Nexus 7 from the US at significantly lower prices inclusive of shipping fees. It isn’t too much of a surprise then, that ASUS Malaysia has finally dropped the price of the Nexus 7. Now retailing at RM899, we feel it is still excessive, especially when Google has dropped the price of the 16GB Nexus 7 to $199 (roughly RM615). On the other hand – and this is purely speculation at the moment – this price reduction could mean that ASUS may be bringing in the newer variants of the Nexus 7, which are the 32GB WiFi as well as the 32GB 3G+WiFi options. We could just be wishfully thinking aloud, but it would be great to finally get some Nexus love in time for the holidays.